Art direction, UI design and illustration for Japan’s number 1 business school Globis University Graduate School of Management. 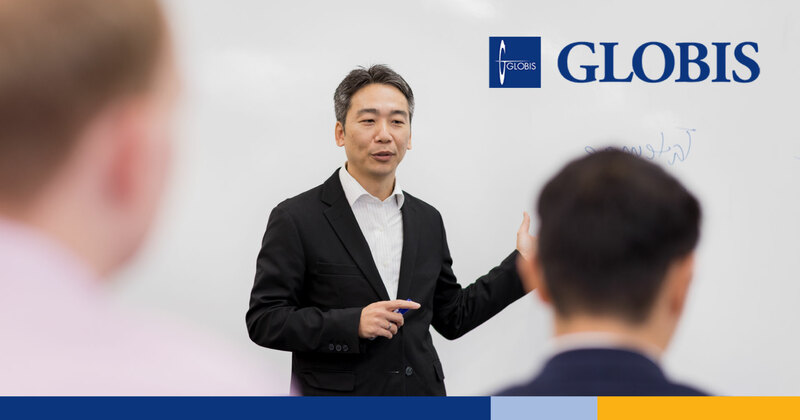 In 25 years, Globis University has grown to become Japan’s largest business school, training more than 100,000 business professionals — with five campuses in Japan and overseas offices in Singapore, Shanghai, and Bangkok. The school offers part-time MBA programs on weekdays and weekends in Japanese and English. 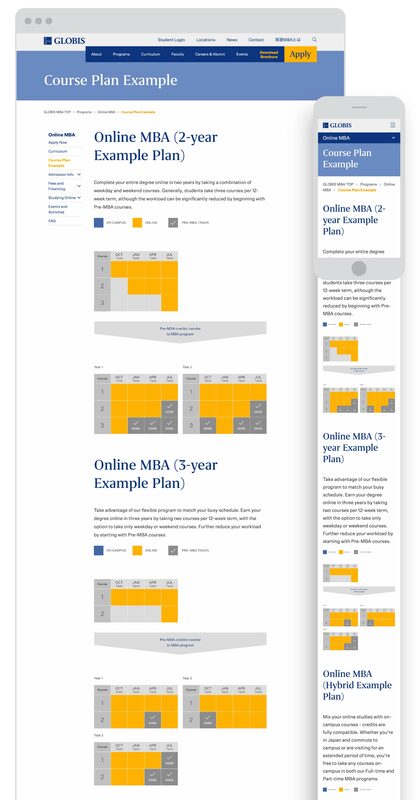 It launched a full-time MBA program in September 2012, and an online MBA program in October 2017. 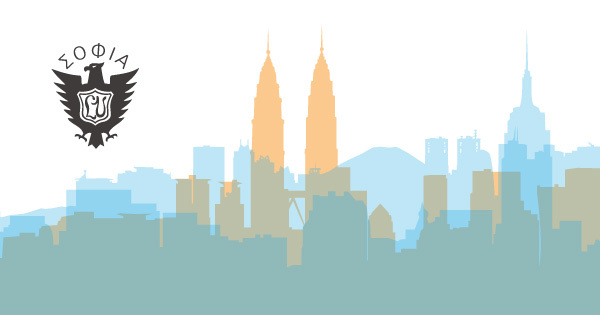 With an ever-growing international network, GLOBIS aims to nurture the business leaders of tomorrow on the way to becoming Asia’s number one business school. 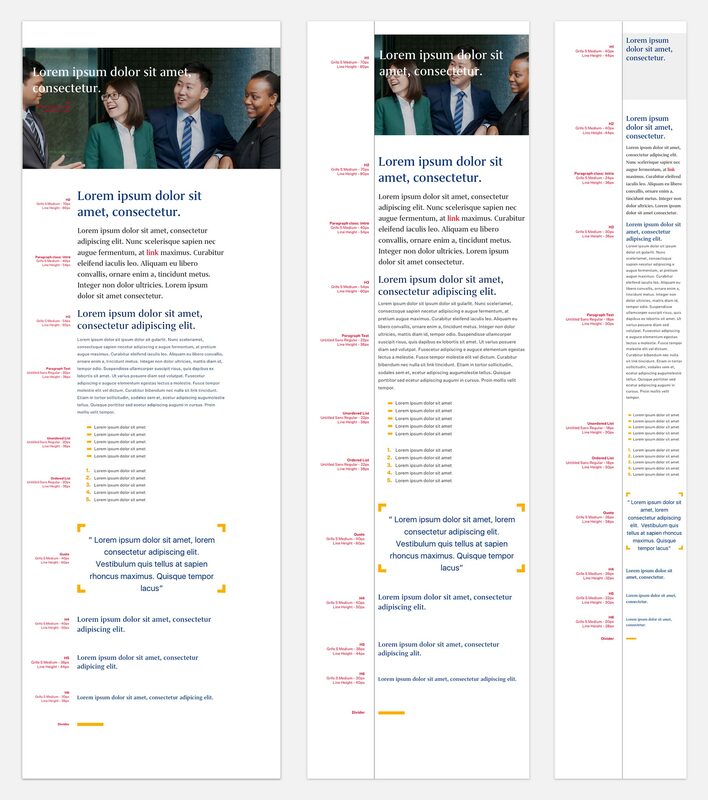 In this multi-stage design project we started with the overall Art Direction and UI design for the new Globis University website. Initially we prepared multiple moodboards with design principles consisting of designs references, typography and font selection, color palette and illustration samples as well as a UI mockups. 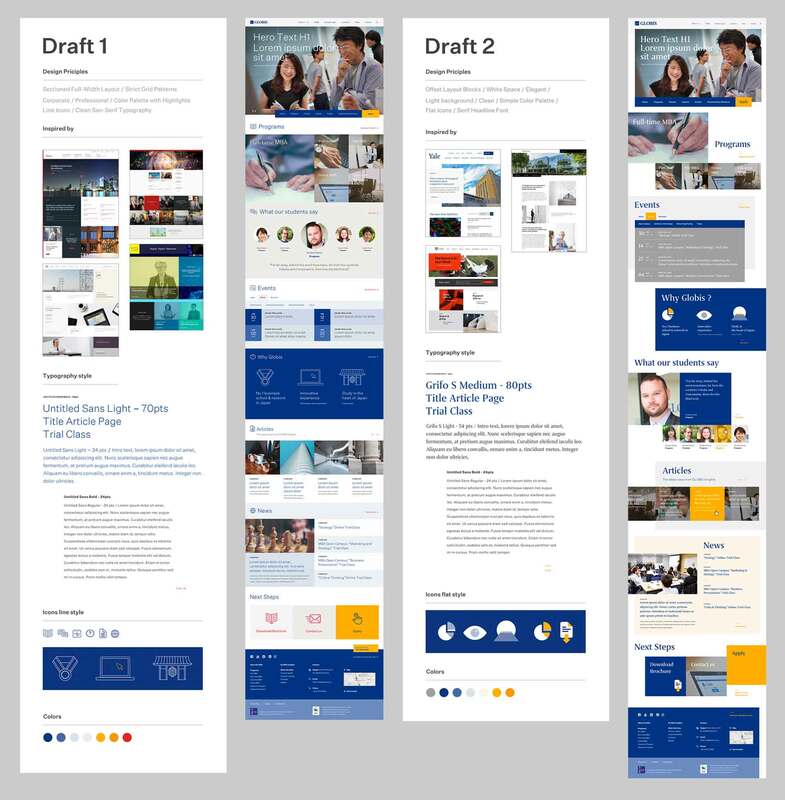 Based on feedback of these moodboards a refined UI design was derived which combined principles of several references. We further compiled a new brand and responsive typography guideline for web usage which did not exist before. To our delight this guideline will also be used for the brand direction of other Globis web properties in future. 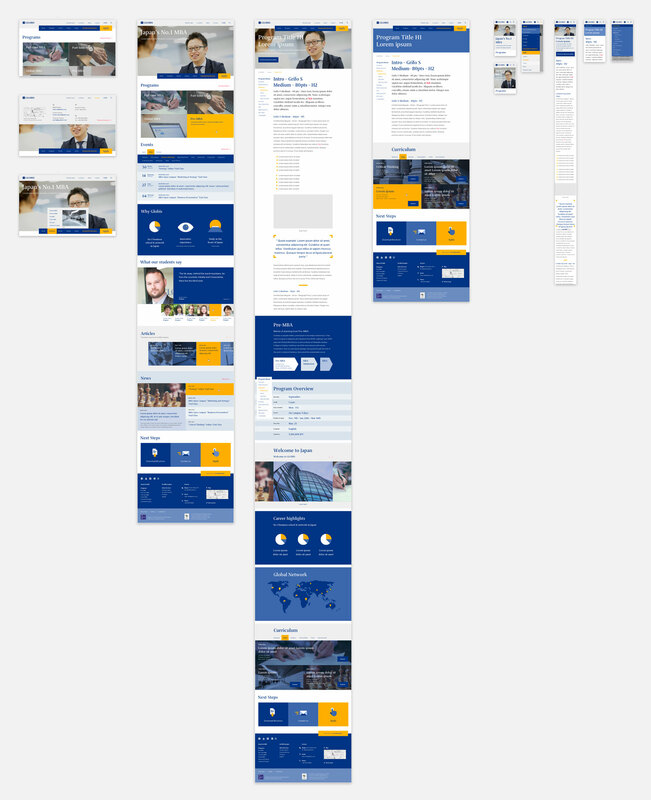 Overall the layout of the new Globis website is based on modules and widgets for certain page sections. These modules can be flexibly reused as needed to create other landing pages. The extension to a full set of templates and the actual web development was provided by a third party. After the initial web implementation Globis scheduled us for an extensive multiple-month design review and quality assurance project. This helped to refine many more details of the website and bring it inline with the original design concept. We further assisted Globis with content creation and illustrations such as charts, diagrams and infographics to better explain and visualize the program structure of their curriculum. 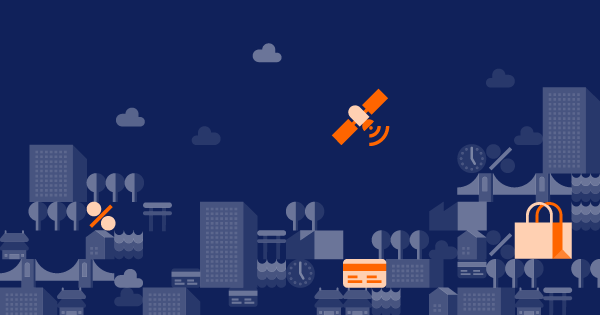 Also the icons used across the website and for CTA (Call-for-Action) buttons are custom designed. Bento Graphics exceeded our expectations for this project. 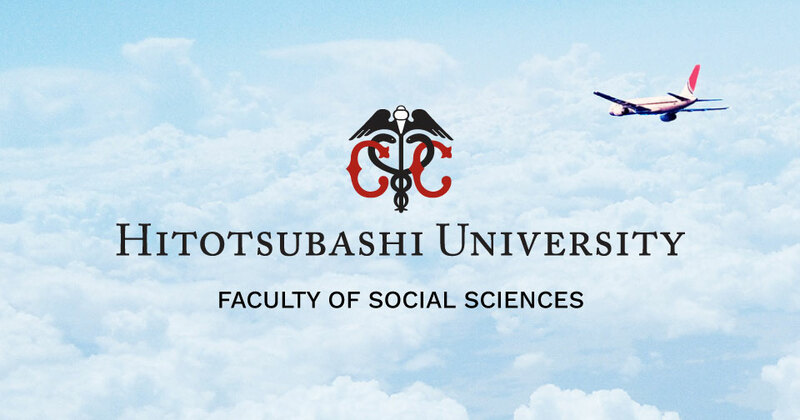 Their modern design, typography, and illustrations redefined our brand, allowing us to reach out to prospective students in Japan and internationally. We were impressed with their attention to detail, timeliness of delivery, flexibility, and more than anything, smooth communication and true understanding of our requirements. We look forward to working with Bento Graphics on future projects!